As Dr. Sakaki looked down at the small form sitting on her office couch, hands upraised recieving the large box of ashes, she couldn't help but marvel. The recipient, not even twenty, was long out of college & interning at Jet Propulsion Labs in California. Was even considered vital to the joint projects between her government & the States. It was hard for the veterinarian to believe that a few short years before, this was the perky ten year old genius attending high school with her & friends. Yet now, a budding scientist/engineer with a more than brilliant future ahead. It pained her to see Chiyo like this. More so as the box contained the remains of a mutual friend. "He was very old Chiyo," the doctor began. "Especially for a dog of his size & breed. You loved him very much to have taken such good care of him." "He had a good doctor ..."
Sakaki seated herself next to Chiyo. "What I'm getting at, & I'm not trying to be mean saying this but ... I'm glad he left the way he did. I don't think I could have ..."
She refrained from mentioning "the procedure". Though in love with her work, there was that one thing about it she passionately hated. Something she did at least once every two weeks. It wasn't pretty. The more cognizant ones, already frightened, could be in absolute terror knowing something to be terribly wrong. Sometimes ... one would fight. Chiyo held the box close, reflecting on recent events. Her busy schedule of post grad & internship at Lawrence Livermore prevented her from caring for a large, elderly dog. With much reluctance, she left him in the care of her parents in Tokyo who were happy to have him back. She, of course, saw him holidays & vacations. A week ago, she came back on a much needed vacation. Four wonderful days were spent together. Two days before , Chiyo let him out thinking he would be back in a few. When the scratching at the door didn't sound after a quarter hour, she went looking for him with some concern. She found him. At his favorite place in the enclosed spatial yard under the big tree. It was as if he had fallen asleep. Tears started flowing. "I wish I was ... there ... when ... when it happened ..."
"He knew he was going hon. He didn't want you to see him leave. He knew you'd find him eventually." "Oh God! It ... it hurts! 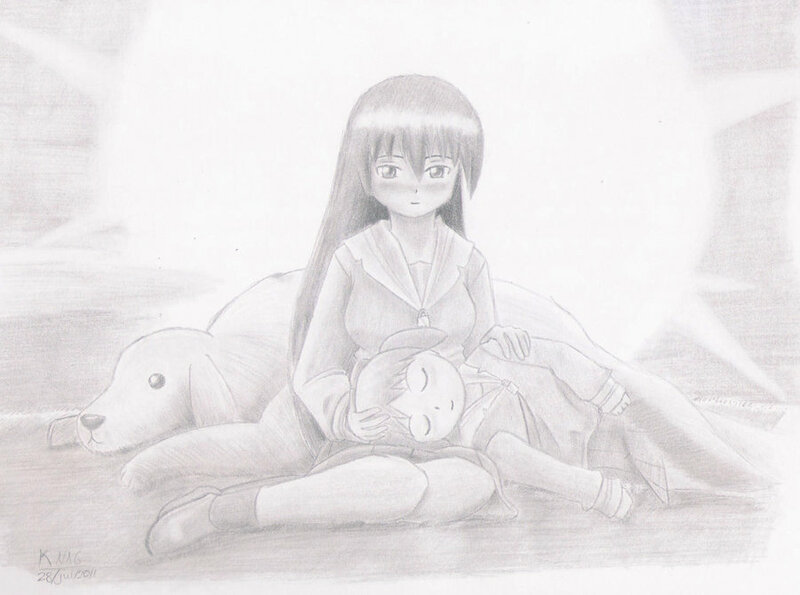 ... so much... Why ... "
Reaching over, Sakaki held Chiyo close. Tears also starting. 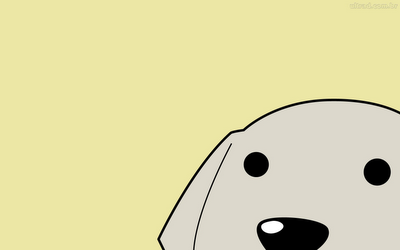 "... he was the first dog I ever petted ..."
"I remember when I first met him. He was the first dog I ever petted. Was always afraid of big dogs. Thought he'd bite me." "And when I saw you get on & riding him ... You were so tiny then ... I was instantly jealous. Still am." "... and when I saw you get on & riding him ... I was instantly jealous ..."
"You have Maya ... and your practice." "As you know, I couldn't have pets until I moved out. You practically grew up with him. I'll never know that. "While I thought of going into veterinary medicine before, it wasn't until that day I was certain." "Mom, Dad & I are going to spread the ashes by the tree this Sunday. I was wondering ..."
"Yomi called about it. We'll ALL be there." "I didn't call as I wanted to ask you personally. You've been so good to him." 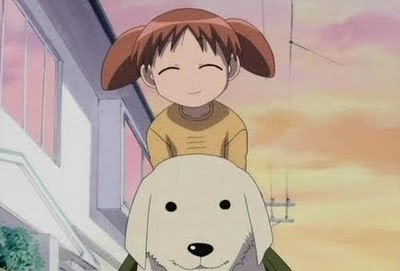 "Thank you Chiyo ... Mr. Tadakichi wasn't a good dog ... He was a great one." "He was ... A man of character." "Yes Chiyo-chan ... He was at that." Not So Oblivious (Sakaki & Kaorin) here. Beyond Wrong & Wonderful, an Azumanga Daioh/End of Evangelion crossover here. Azumanga Daioh, Where Are They Now? here. 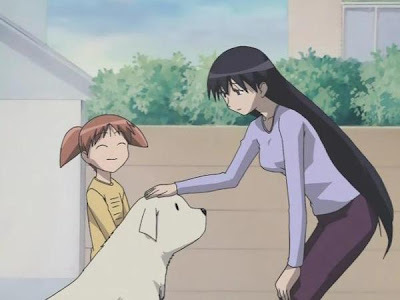 Azumanga Daioh, Too Much Cute (review) here. Sakaki meets Mr. Tadakichi You Tube video here. Disclaimer: The preceding is a NON-PROFIT work of fan fiction for entertainment purposes only. I make no claim to ownership of the copyrighted names/characters, places, some dialogue & events mentioned in this work. They are the sole properties of J. C. Staff. Please, by all means support the owner of such properties in the purchase & enjoyment of their products. DISCLAIMER: All images used on this blog are strictly copyrights of their owners. I do not claim credit/ownership for any images used here in my blog unless stated otherwise. If I have offended anyone by posting any images on my blog, please contact me via email and I will remove specified image(s) ASAP.